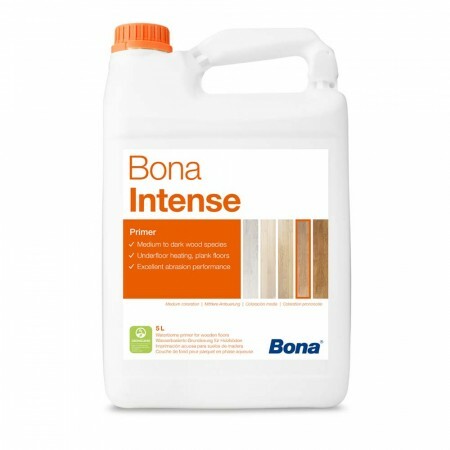 Bona Prime Intense is a single component, 100% polyurethane primer for use on wooden floors prior to overcoating with Bona waterborne finishes. Bona Prime Intense produces a rich colouration whilst providing increased ‘build’ on the timber surface improving wear resistance. Bona Prime Intense should be used for the initial coat on floors which have been stained. 1. Using a Bona Roller, apply the primer evenly avoiding accumulation of product. Care should be taken to achieve a uniform level of timber saturation to avoid colour variation. Always maintain a ‘wet edge’ to avoid overlaps. 2. When dry, abrade to reduce grain raise using the Bona Scrad system or a sanding screen grit 150 or finer. 3. Remove all dust and apply 2-3 layers of a Bona Waterborne Topcoat depending on wear resistance requirements.